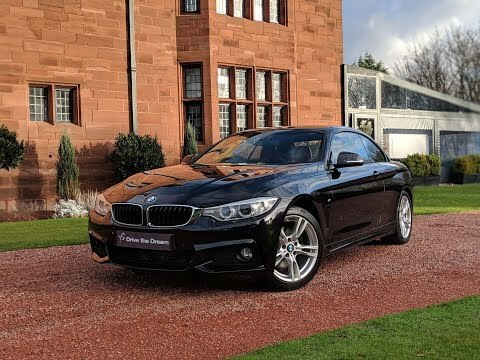 BMW 4 Series 430D M SPORT Convertible Automatic Professional Navigation, Bluetooth connectivity, 18 Inch Alloys, And much more! 2015(65) BMW 4 Series 430D M SPORT Convertible Automatic Professional Navigation, Bluetooth connectivity, 18 Inch Alloys, And much more! Recently arrived, we have this beautiful BMW 430D M sport convertible with a lovely specification as follows; Wind deflector Upgrade, Brushed Aluminium trim finishers with Black high-gloss highlight Upgrade, Black Sapphire Metallic, Dakota Leather - Coral Red/Black, Automatic professional navigation, 18 inch alloys, Tyre pressure monitoring system, Auto dimming rear view mirror, Dual chrome exhaust, Front fog lights, Heated windscreen washer jets, My aerodynamic bodystyling, DAB radio, Bluetooth connectivity, 3 spoke leather M sport multifunction sports steering wheel, Dual zone climate control, Anthracite headlining, Anthracite velour floor mats, Heated seats, Front electric sports seats and more. Please register any interest.